Potatoes contain vitamins and minerals, as well as an assortment of phytochemicals, such as carotenoids and natural phenols. These are just some of the reasons the potato has become a culinary staple around the world, even though it can be an arduous task to produce in some circumstances. 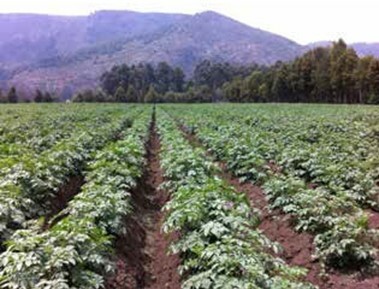 Potatoes thrive in well-drained, loose soil with consistent moisture. Good ground preparation, harrowing, plowing, and rolling are always needed, which is why soil structure and viability are key concerns for growers. Humega® is used consistently in these trials specifically for this purpose. It is an organic, biologically enhanced humic acid, which facilitates soil tilth and boosts microbial activity. BioFlora® utilizes a proprietary extraction process that is unique to our business, which aids our approach in maintaining the integrity of the humic acid we produce. In general, recent academic studies have also discovered that humic acids not only affect soil condition, but also plant life. These organic acids increase the rate of germination, stimulate plant growth, amplify root system development and promote increased biomass yields. In Case 1, the trial was conducted in Idaho Falls, Idaho by Dr. Bryan Hopkins, a potato crop specialist, from the University of Idaho, College of Agriculture. The trial was conducted for a one year period on Russet Burbank cultivars in three separate fields. Each field was divided evenly between treated and untreated plots for comparison. The untreated field plots received a standard conventional program. The treated fields received the same treatment, with an additional application of Humega at 20 gallons per acre. The findings of this study showed a remarkable improvement in both tuber yield and quality for the treated plants. The average total yield improvement was calculated at 68 cwt/acre or a 20% yield increase in the BioFlora field plots. There were consistently more 4 – 7 ounce tubers in the BioFlora plots and there was also significantly fewer malformed tubers in the treated acreage. The conclusion was that supplementing with Humega in a standard fertilization program can produce superior results. The above picture is the treated field after only two years of Humega use. Notice there are still large clods visible in the soil, but there is little clay soil clinging to the potato surface. Soil improvements allow the field to provide better quality produce for the grower and the consumer. On the treated acres, it was observed during the season that the potato crop showed more vigor and seemed to convert fertilizer better than the control. At harvest, it was noted that there was a significant improvement in the structure of the old floodplain clay soil with fewer clods. 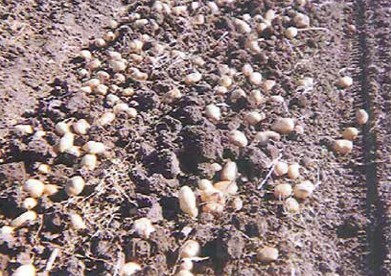 The treated potatoes showed no bruising and had better uniformity and specific weight than the untreated field. At harvest, yield was calculated at 1.76 tons per acre more in the treated plots than the untreated plots. 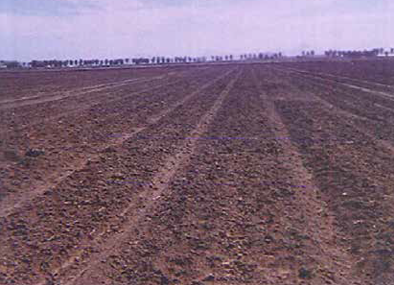 The improved soil structure resulted in reduced clods and less crop damage at harvest. The cost of Humega® was $29.15 per acre and the gross return was $0.16 per pound on the 88 tons per acre increase. This equals a $28,160 or $563 per acre profit to the grower. The above picture is the same field treated with our Humega, GOgreen, and Fulvex blend. This photo was taken only ten (10) days after the blend was applied. 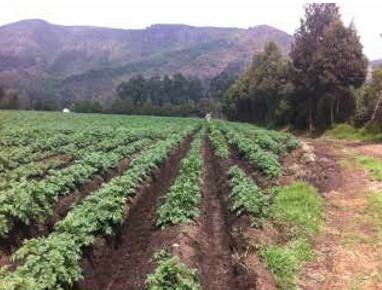 Notice how quickly the potato plants throughout the field have recovered from their stressed state. Programs are tailored, event driven application strategies specific to the agricultural area, cropping system and climate, as well as specific environmental and grower needs. 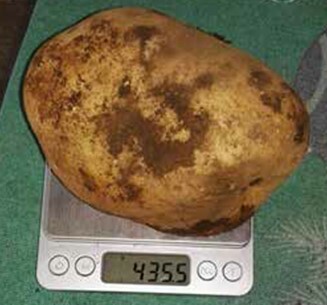 This above photo shows a BioFlora treated chipping potato weighing in at 435.5 grams (15.36 ounces) at harvest. This is considered at the top range of the “large” size classification, and will bring more profit back to the grower. 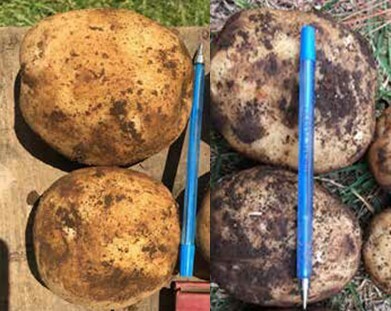 The above pictures (left and right) show the uniformity of size and color in the BioFlora treated potatoes across the tested field. As you will notice, these chipping potatoes are perfectly rounded and have thick skin, which acts as another layer of protection against diseases. GO Isolates®: an organic-acid base fortified with two strains of the microorganisms Bacillus amyloliquefaciens and Bacillus subtilis. This product’s patented isolate formulation prevents the damage caused by many soil-borne plant pathogens. BioFlora was founded in 1972 with a goal to conceptualize, develop, manufacture, market, and deliver a proprietary product line to the agricultural community. Through our innovative products and programs, we provide solutions to our customers in both domestic and international markets. Today, we have over 30 unique proprietary products that benefit growers, retailers and consumers alike. Our organic and sustainable agricultural programs maximize the efficacy and efficiency of traditional agricultural inputs, while being mindful of their environmental impact.